It has been a long time since I have read any of Alan Dean Foster’s work. This is strange as he was a staple author for myself and my friends in our teenage years. When I got the chance to pick up ‘The Human Blend’, I took the liberty of picking up the other two books that make up ‘The Tipping Point’ trilogy. It was time to renew my acquaintance with a long lost friend. 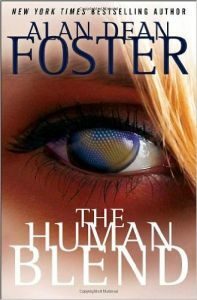 ‘The Human Blend’ is set at least one or maybe two hundred years in the future. Initially set on the east coast of what was the USA, global warming and accompanying sea level rise has dramatically changed the landscape. The nation states don’t really figure in the plot so it’s difficult to say at this point if there have been any significant changes. What has changed, though, is the ability to change the human form. Following breakthroughs in science and its subsequent commoditization, it is now possible to change just about any physical aspect of your body for a price, of course. This is called body melding with the resulting people called Melds. When they get their first Melds, people adopt a Meld name usually to reflect the nature of the meld they have just had. Unmodified people are called Naturals but there doesn’t seem to be many of them. Human Blend opens with a couple of low level criminals Melds about to rob a victim of his body melds. The first criminal, Jiminy, has melded legs that are twice the length of normal human legs. They are very useful for running away from trouble and also remind people of Jiminy Cricket, hence the name. Whispr (that is how it is spelt) is the second criminal who had been obese in childhood. As soon as he was legally able to do so, he had the melds required to make him very thin and very light. He was now able to walk up to people as quiet as a whisper even if he can’t spell it right. The duo killed their victim by stopping the man’s heart with a technical gizmo that interfered with his pacemaker. While Jiminy liberates the meld hand ready for resale, Whispr notices a metallic thread hidden in the victims clothing which he also purloins. It’s this metallic thread which may be an information storage device that’s the central driving force for the rest of the book. It is made of a metallic substance which should not exist at room temperature and pressures. Whether it’s the material or the information it contains several people think it is extremely valuable and want it. Having been shot, Whispr seeks the help of a Doctor Ingred Seastrom who becomes intrigued with the thread. The good doctor is an odd one as she not only takes her Hippocratic Oath seriously but she is a Natural. It appears that the thread is made of the same material as a nano-sized device she found on the head of a 15 year-old patient she treated for a bad meld. Just as Seastrom started to scrutinise the device, it disappeared from its enclosed observation chamber. Her scientific curiosity piqued, Seastrom forms an unlikely alliance with the criminal Whispr to uncover the secrets of the strange thread. Just to make things interesting, there are several trained and equipped corporate assassins out to recover the thread. They don’t appear to be working for the same employer, so there’s competition between them. What follows is a frantic dash as the Seastrom and Whisper frantically try to stay one step ahead of their pursuers while trying to find someone who can help them investigate the contents of the thread. This story really grabbed me, making it hard to put down. It’s not a particularly long book at 226 pages but it is a large format paperback so I suppose you get more words per page. There is also a 12 page excerpt from volume 2, ‘Body Inc.’ just to whet your appetite. I didn’t read this as I have the actual book here on my desk just ready to dive into. I‘m impressed with the environment Foster portrays for the south east USA. Away from the big cities, people are still trying to make a living from the wetlands. Some of it is legal and some borderline. People are having Melds to help them with their chosen profession which makes for a wonderful assortment of body types.